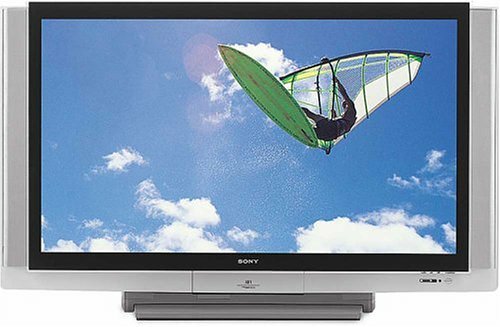 Sony KDF-70XBR950 is 70 inch Sony WEGA television with the flat, FD Trinitron screen. It has a resolution of 3.58 million dots for stunning detail and clarity with fixed pixel display and constant light image flicker. Along with it has 3:2 pull down detection and reversal removes redundant video information for display and constant light prevention. Its WEGA engine keeps the images in digital domain and an optical engine ensures high resolution corner. It is provided with two speakers and a powered subwoofer of 20 watts. 6. Picture enhancers: WEGA engine, optical engine, DRC Multi-function, DDC (Direct Digital Circuitry), Multi image driver-X(MID-X), Image Quality Enhancer, Clear corner Focus. 9. Connector types IEEE 1394(FireWire, LINK), Audio line in, composite video/audio input, Fixed/variable audio output, HD component input, control S, DVI-HDCP, S-video input, RF input, SPDIF output. Sony High definition projection television gives you a captivating entertainment with advanced elegance. Its feature together gives you an extraordinary picture and sound. It has facility of picture in picture view, Multi-channel Preview, MTS stereo reception system. It has 181 Analog channel preset. Supporting devices are TV, VCR, cable box, DVD player, Satellite TV system. It is Multi brand compatible. I have blue haze and blue pixels on the screen. I was told this is caused my a bad Optical Engine. The warranty is over. Can I change this component myself?